Luiza Zambrana is a Brazilian woman who is passionate about social transformation and people development. She learned about empathy with social entrepreneurs and believes that we all can be changemakers. 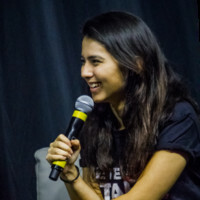 Luiza is a graduate from Mackenzie Presbyterian University in São Paulo and has worked with the development of entrepreneurs and startups in Brazil in organizations such as Ashoka, Abstartups and in the production of “Conferêmcia Anual de Startups e Empreendedorismo” (CASE), the largest event for startups in Latin America. In addition, she is a columnist at Startupi publishing articles about Innovation and Entrepreneurship. Through her experiences, she has learned the importance of empathy, leadership, and collaboration as tools for change so she decided to become an Amani Fellow because she believes she can make a difference.